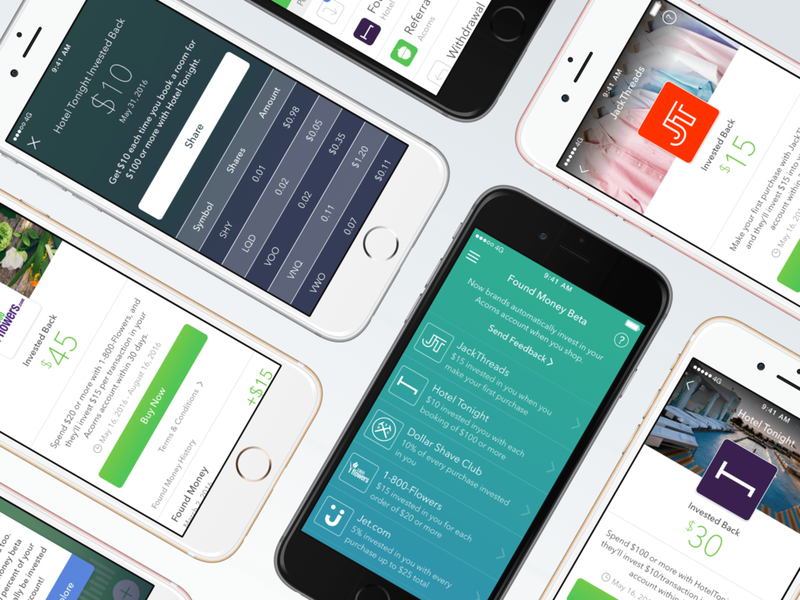 Acorns is a finance app that simplifies investing for young people. During my time at Acorns, the company was exploring new ways to monetize, which eventually initiated a program called Found Money. 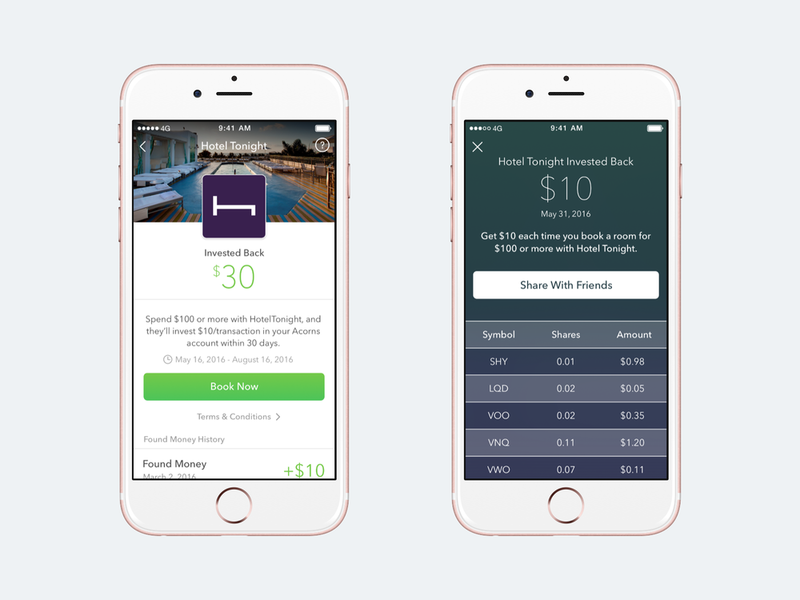 Found Money (still in existence today) is a "cash back" platform where users receive direct investments in their Acorns account from merchants they spend with. Airbnb, Lyft, and Nike are all partners on the platform today. We shipped a beta in 6 months with 5 partners and generated $20k of revenue from 30k users the first few weeks of launch. Acorns needed a way to generate revenue. A fee-based model based on account balance was inadequate since most young people carried a low balance. Products rooted in ads are often intrusive and deteriorate the user experience, especially in a sensitive space like personal finance. We wanted Found Money to be genuinely useful for users and not feel penny-pinching as so many deals-based experiences did. I began this project by organizing what the information architecture would look like. What are the main points of navigation? How does the user begin this journey? How does it end? There were 3 main components to Found Money. Overview: The overview page displays a general snapshot of what deals are available, how much the user had invested in total through Found Money, and see specially promoted deals. The goal here was to display both new deals that might be useful as well as show how much value Found Money can accrue over time. Offer detail: The brand detail page sheds more light on a specific deal from a merchant. The challenging part here was balancing the color scheme and branding of the merchant with those of Acorns (there's a fine line between elegant branding and generic stock photography). System integration: Finally, rewards accrued from Found Money had to appear throughout the rest of the app. Key pages like Home and History had to incorporate Found Money earnings. Promoting notifications was also important as this was often the first part of entering the Found Money flow. Overview page explorations. 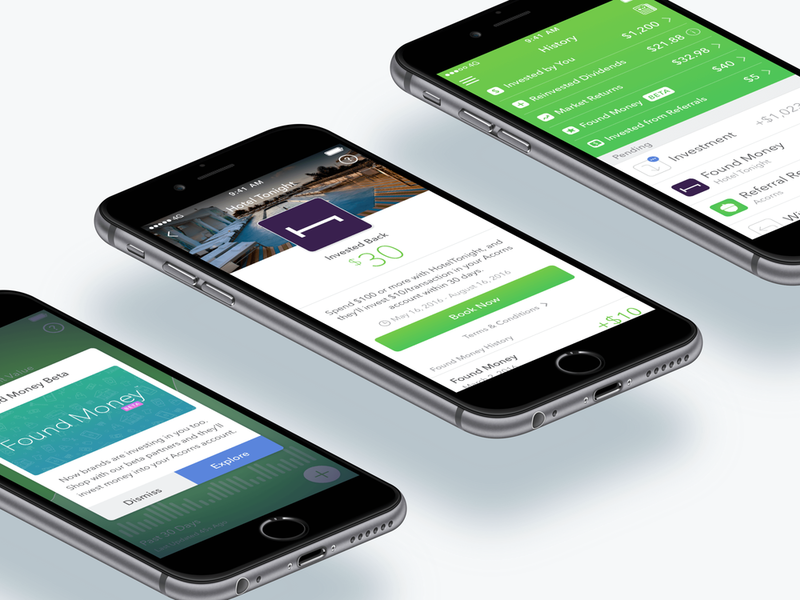 We shipped the rightmost version for the beta. The overview page went through many explorations. A motif I deeply explored was the idea of representing each offer as a card. A stack of cards in many ways looks and feels like a wallet, a familiar experience for most users. Wallets also have a connotation of security and value, which were themes we wanted Found Money to communicate. Another challenge in designing the overview was balancing the color palette of Acorns and any given merchant. Acorns had a very strong brand identity (gradients!) and we wanted to preserve our branding while balancing those of the merchant (this became an issue for some brands with equally strong branding or clashing color schemes). We ultimately went with a minimal direction where we displayed the merchant logo mark with a description on top of a gradient background. Offer detail page explorations. Did not ship any of the above. Prominent merchant branding: A third or fourth of the initial viewport is dedicated to the branding of the merchant. While many of the previous views balanced some sort of Acorns branding, here, the designated merchant was the sole focus. Highlighting dollar value: A key part of the Found Money story was that these merchants would be investing in users over a long period of time. It wasn’t meant to be a one-time transaction, but rather a partnership. Nike may only invest $1 today, but over time that $1 can grow into a larger, more meaningful amount. The dollar amount was a nod to this narrative. Description of the offer: Finally, we had to ensure the language of the offer details were simple and easy to understand. Visually, each offer detail only occupied 2 or 3 lines so that they appeared less jarring. The actual content of the offer was also designed be as simple as possible with as little strings attached. Final version we shipped showcasing the 5 partners we launched with. //FILLER After setting these goals and refining our user persona (millenials), I then moved onto the ideation phase and explored possible options. For inspiration, I created a mood-board collecting countless examples, everything from home-screens of delivery services apps to generic social media profiles to guide the offer detail page. As I was collecting these different points of inspiration, I also mapped out the information architecture of Found Money and the user journey with the rest of our design team. // FILLER In light of this feedback loop of buying and sharing, I designed the brand detail page so that the most prominent action to take was to eventually shop using the big green CTA — not in an intrusive, annoying way, but in a curious fashion for the user to explore the offer details first, then shop. Found Money was the first big project I designed for and shipped. See it for yourself (and its evolution over the years).